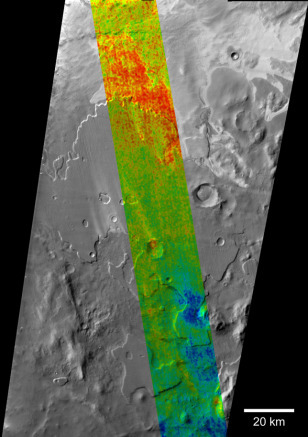 NASA's Mars Odyssey conducted this thermal scan of a strip of territory in Mars' southern hemisphere. The blue spots indicate where water ice lies less than 1 centimeter (half an inch) below the surface. Red colors indicate areas where the ice is at least 7.5 inches (19 centimeters) below the surface. The scale bar is 12 miles (20 kilometers) long.